British automaker, Bentley, have been behind some of the most iconic luxury vehicles including their groundbreaking Bentley Continental GT, first launched in 2002. For their Continental GT luxury car, Bentley invited Breitling, the Swiss specialists in chronographs, to create the onboard clock. The relationship between the two luxury brands was further cemented in 2003 when Bentley made their legendary comeback at the Le Mans race, where Team Bentley claimed victory by securing both 1st and 2nd place. To celebrate the triumph, Breitling, a main sponsor of Team Bentley, released the Bentley Le Mans limited edition watch. 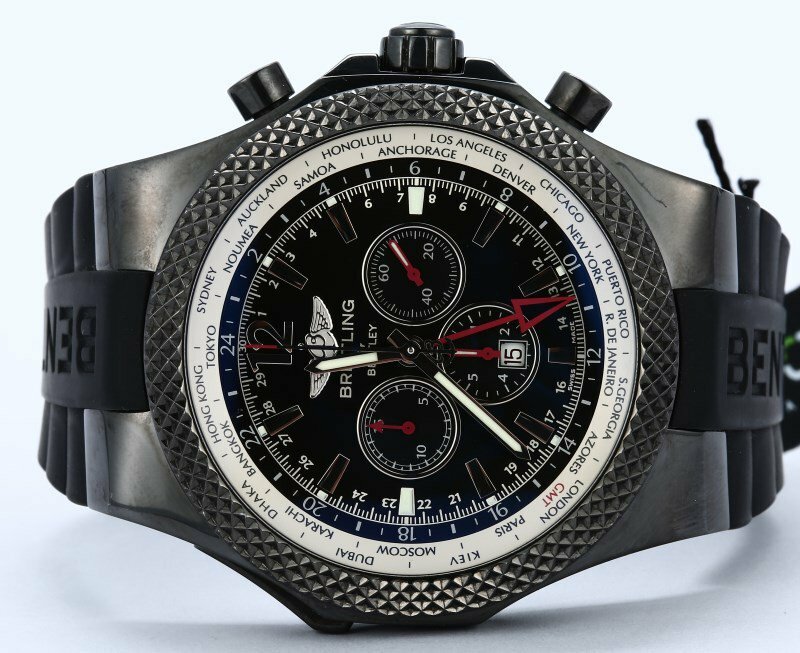 The auto-inspired luxury watch was such a success that this marked the beginning of a creative partnership between both companies — the Breitling for Bentley series of luxury watches. Each of the Breitling for Bentley timepieces highlights the pursuit of prestige and performance at the core of both companies. All of the watches produced under the dual branded collection are driven by COSC-certified chronometric mechanical movements for steadfast reliability and accuracy. Complementing the engines within, the aesthetics of the Breitling for Bentley watches are infused with design elements from the luxury vehicle — such as the renowned Bentley honeycomb grille pattern found on the bezels. 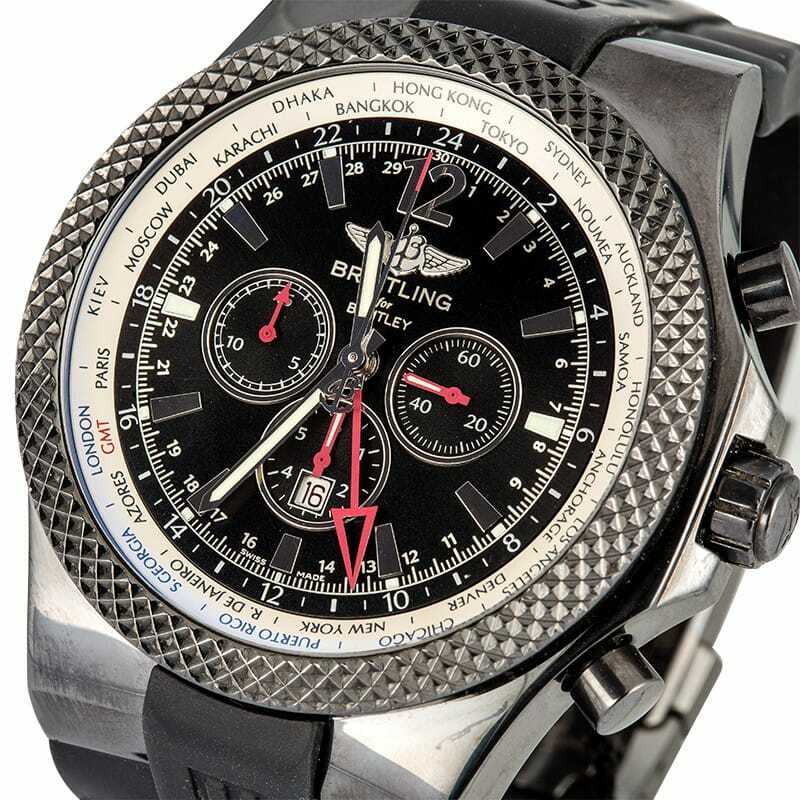 This particular Breitling for Bentley piece, the Bentley Midnight GMT Carbon, is one of only 1,000 pieces created. Its imposing 49mm stainless steel case is enforced with a highly resistant carbon black coating and equipped with large push pieces and a protected fluted screw-locked crown. The intricate dial includes a multiple time zone display, three counters, and a date window just above the 6 o’clock position. The red accents on the dial adds a dynamic flair while the integrated rubber strap stamped with BENTLEY enhances the luxury watch’s modern appeal. 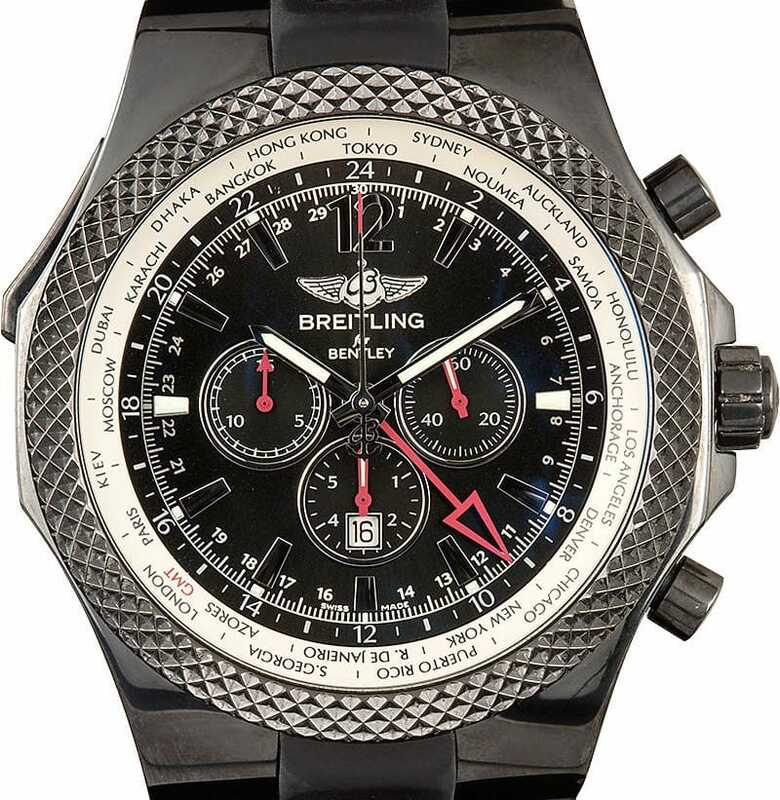 The Bentley Midnight GMT Carbon is powered by the Breitling Caliber 47B automatic mechanical chronograph movement. The COSC-certified caliber boasts a high frequency of 28,800 vibrations per hour and 38 jewels. The watch also features the exclusive “30-second chronograph” function based on a 1926 Breitling patent — meaning that the center hand sweeps around the dial in 30 seconds rather than 60 seconds, allowing for extremely accurate 1/8th of a second time readings. Small seconds indicator is found at 3 o’clock, 6-hour totalizer at 6 o’clock, and 15-minute counter at 9 o’clock. The knurled bi-directional rotating bezel features 24 cities that represent 24 time zones, which in conjunction with the 24-hour GMT hand, gives the wearer a second time zone display. The GMT-hand is controlled independently from the center hour and minute hands via a pusher at 10 o’clock. 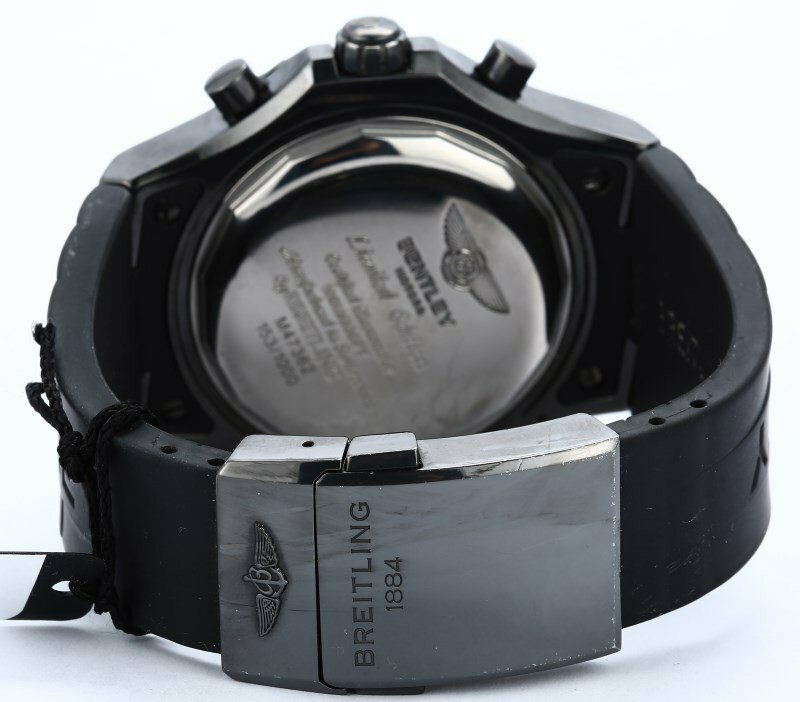 As this is a limited edition collection, this individually numbered Bentley Midnight GMT Carbon is #153 out of 1,000 pieces, which is denoted on the caseback (153/1000), along with the engraved Bentley logo. 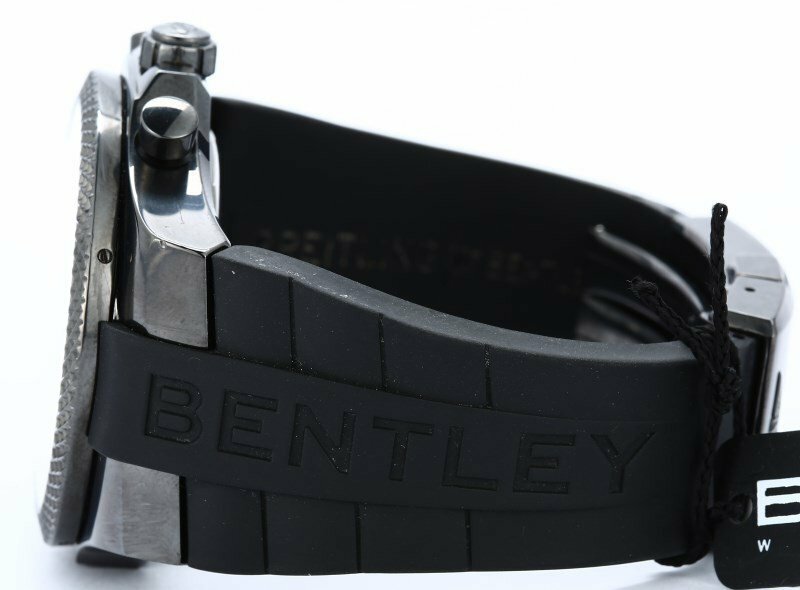 Sporty in look and highly technical in functionality, the Bentley Midnight GMT Carbon is the perfect oversized luxury sports watch for both watch and car enthusiasts.